If you’ve ever had the thought that throwing out your pillow might be a good idea, you may be on the right track – IF you are a stomach sleeper or back sleeper. These positions often place strain upon the lower back due to inconsistencies with the cervical alignment due to mattress choices, injury, or health reasons. Supporting the spine in a way that it helps elongate it and stretches it out influences a more natural position. Many stomach sleepers have trouble with personal comfort preferences without a pillow and prefer the cushioning of an extra layer between their head and mattress. The problem with a pillow as a stomach sleeper is that no matter what you do, you will always compromise the spine in some manner due to having to turn the head in one direction or another. This is actually the least healthy position to sleep in, but one can hardly control what position they naturally fall into when asleep. Therefore, you need to consider what best supports your body. Stomach sleepers who need a pillow for personal comfort will best be supported by a very thin and/or a very soft pillow that places their head as close to the mattress as possible. And if you can do without a pillow, then you should. 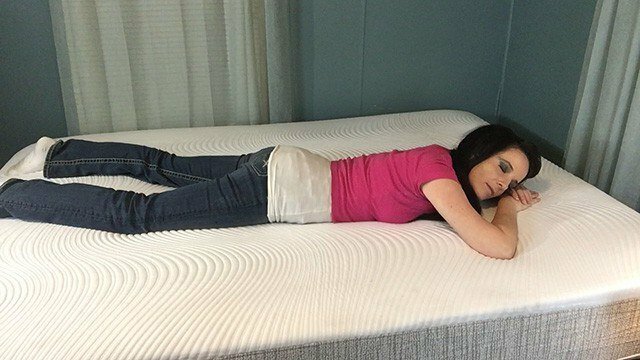 Placing your head on the same level as your mattress can actually help straighten your spine, and it takes the strain off your neck and shoulders as well as your lower back.